DeelaSees: Everybody Comes from Somewhere - Straight Outta Compton. Everybody Comes from Somewhere - Straight Outta Compton. As I did when I saw Twinsters, I gave myself a week to process the film before writing about my thoughts on it. Hoping that I won't say too much of what's already been said, although perhaps that's unavoidable. Over the past few years I've become more selective about which films I bother paying to see, but even with the great feats of cinematic storytelling that I've seen this year, I don't remember loving them at first viewing as much as I loved this one. 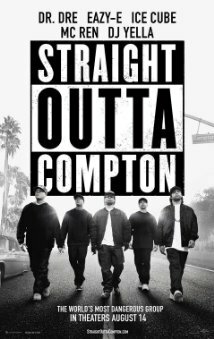 A biopic about N.W.A ("Niggaz wit' Attitudes") a rap group composed of five rapper and musician friends out of Compton, California. From a town considered to be "nowhere", these nobodies were among the pioneers of gangsta rap and "reality rap" emerging in the late '80s and early '90s, using their art to express the cruelties of their everyday reality. While many (including white parents and the Feds) lambasted N.W.A. for glorifying violence, many more loved them and their music for keeping it real. N.W.A. made history, prized their integrity as artists, and their impact helped to inspire and launch the careers of many monumental hip-hop artists who followed after them. "The World's Most Dangerous Group"
What I don't like about this film: Already there has been much criticism that Straight Outta Compton too conveniently portrays these men as good ol' boys, sweeping over the more unsavory details of their behavior and never questioning the way women are used (both around them and by them directly). To that I give the same answer I gave to a friend who questioned me about this: Those arguments are more than valid. But personally, I watched the film first and foremost to learn more about N.W.A. as people/artists with vision and integrity who made an impact, and in that vein I still think the movie is exemplary. 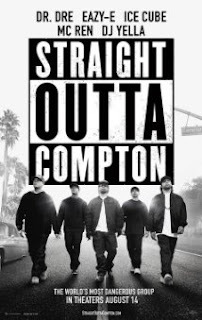 With that said, the only complaint I have about the film is that I wish the audience would've been given more of an opportunity to become acquainted with MC Ren and DJ Yella. As someone who'd been vaguely familiar with N.W.A. beforehand, I hadn't even remembered there being members other than Eazy-E, Dr. Dre, and Ice Cube. Ren and Yella were plenty visible, but still somehow faded into the background, which perhaps also happened when the group was in its prime. I don't know. Regardless, I would've liked to know more about them. Would I recommend it? : Absolutely! Not only that, I wholeheartedly believe that this film should be required music history viewing. Straight Outta Compton is a cinematic masterpiece and a phenomenal piece of history. Y'all know what to do. That is all.